One of the most successive fixtures yet held at Wirrulla, a progressive district on the Thevenard Railway, took place on Thursday, February 4, when the Wirrulla Memorial Hall was opened. 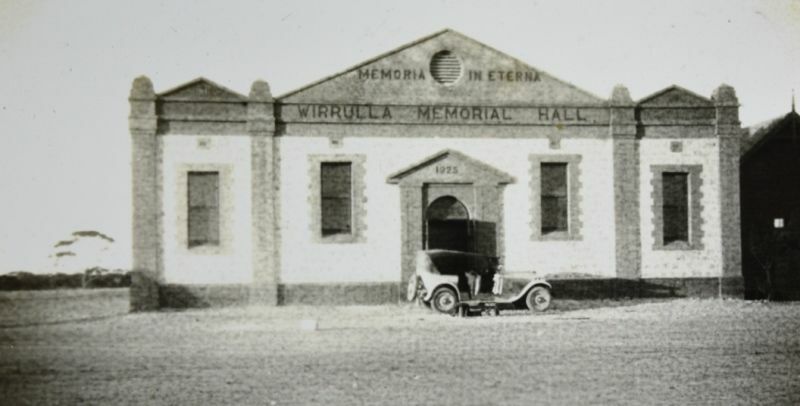 Some considerable time back the returned soldiers of the Petina sub-branch moved in the matter of erecting a memorial to soldiers who fell in the Great War, and eventually it was decided to erect a memorial hall at Wirrulla for this purpose, and today they have what is claimed as one of the best halls on the west coast. This worthy memorial has met with great support not only from Wirrulla, but from the surroundng districts, and the fact that upon the hall being declared open over half of the approximate cost had been raised, goes to show that residents have the feeling of the cause at heart. The opening ceremony took place in the presence of 400 people, this constituting a record for the district. The Chairman (Mr. C L. Campbell) addressed the people and introduced Mrs. J. S. Pearson as the lady chosen to declare the hall open, and invited her to perform the ceremony. The Register (Adelaide), 16 February 1926.